Clarify your complexion with the men-ü Matt Skin Refresh Gel, a refreshing, fragrance-free toner that helps to balance oiliness and shine while soothing and calming to help overcome ingrown hairs after shaving. Lasting up to 120 applications, the anti-shine toner gel is enriched with blemish-fighting Salicylic Acid and Witch Hazel to help eliminate bacteria and impurities from deep within pores; it effectively controls excess oil that can contribute to blocked pores and breakouts. Delivers a toning and tightening effect and contains anti-inflammatory Willow Bark Extract which helps to calm any redness and irritation. Expect calmer, clearer and healthier-looking skin. Suitable for normal, combination and oily skin types. After shaving and / or washing - rinse and pat dry with clean towel. Apply 1 to 2 shots over the face and neck, massaging in gently. Use more if required. Allow 30-60 seconds to dry. 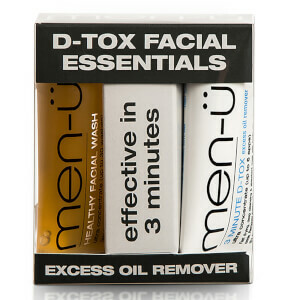 Cleanse with men-ü Healthy Facial Wash before use and apply a men-ü moisturiser to finish, as required. Aqua, Alcohol Denat., Hamamelis Virginiana (Witch Hazel) Extract, Glycerin, Salix Nigra (Willow) Bark Extract, Amorphophallus Konjac Root Powder, Polysorbate 20, Aloe Barbadensis Leaf Juice, Phenoxyethanol, Triethanolamine, Carbomer, Benzoic Acid, Dehydroacetic Acid, Triethylene Glycol, Panthenol, Ethylhexylglycerin.